We absolutely love bubbles. We live in sunny California so we are outside with bubbles all year long. Last summer I we made some patriotic bubble wands using pipe cleaners inspired by these bubble wands by the The Artful Parent. 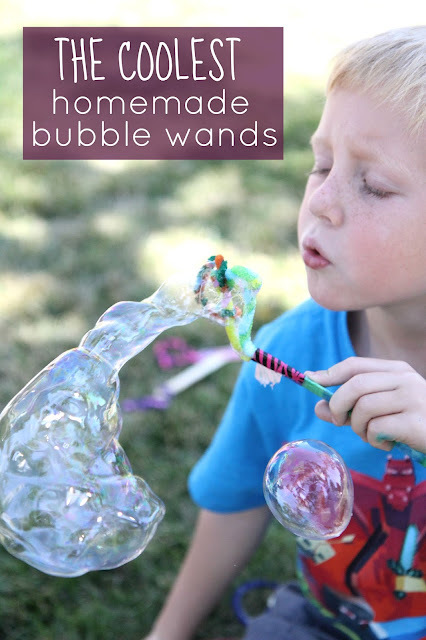 Since then we have tried finding ways to use even simpler materials we have around the house to make bubble wands. 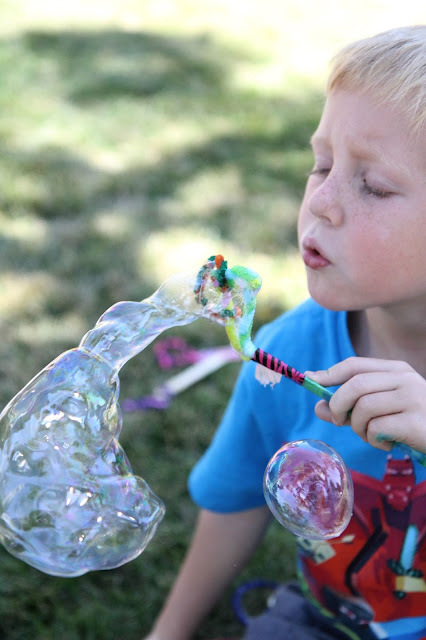 Today I'm going to show you how we used craft sticks, pipe cleaners, and tape... plus a few other things, to make some truly awesome bubble wands. 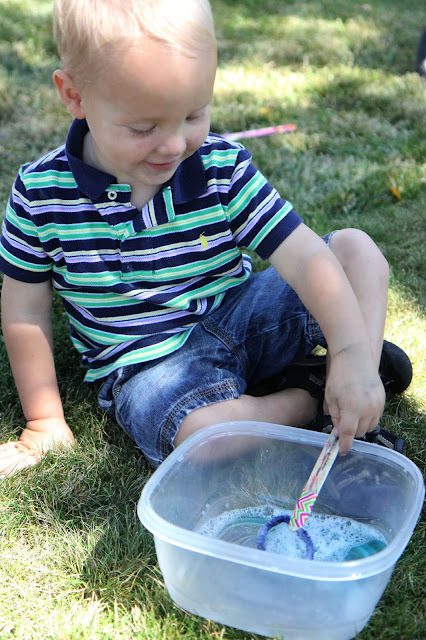 To get started with this little craftivity (craft + activity) first you need to gather all of your materials to make bubbles wands. Start by decorating your craft sticks with markers. Then use your pipe cleaners to make whatever shape of wand you want. Some of my kids wanted heart shaped wands (which involved me helping a bit) and some of my kids just wanted oval or round ones. My first grader wanted his wand to have three or four circles! We twisted two pipe cleaners together to make a thicker head and then we attached them to two other twisted pipe cleaners so that the heads of the bubble wants were pretty big! Next we wrapped the ends around the craft stick and used the tape to secure them in place. With some of the wands we just wrapped tape around the top and with some we wrapped tape down the entire craft stick to create a handle completely covered in tape. Each kid had a different plan for how they wanted theirs to work. After that we mixed up our bubble recipe!! We love the bouncing bubble recipe from A Little Pinch of Perfect and the super easy dish soap recipe from Housing a Forest. We doubled A Little Pinch of Perfect's recipe for our first attempt so that there were lots of bubbles for all three kids to make! Next we took our bubble solution and wands outside!! The recipe from A Little Pinch of Perfect calls for sugar, which makes the bubbles a little sticky but they hold together really well. Plan on getting a little messy. We kept wipes nearby. 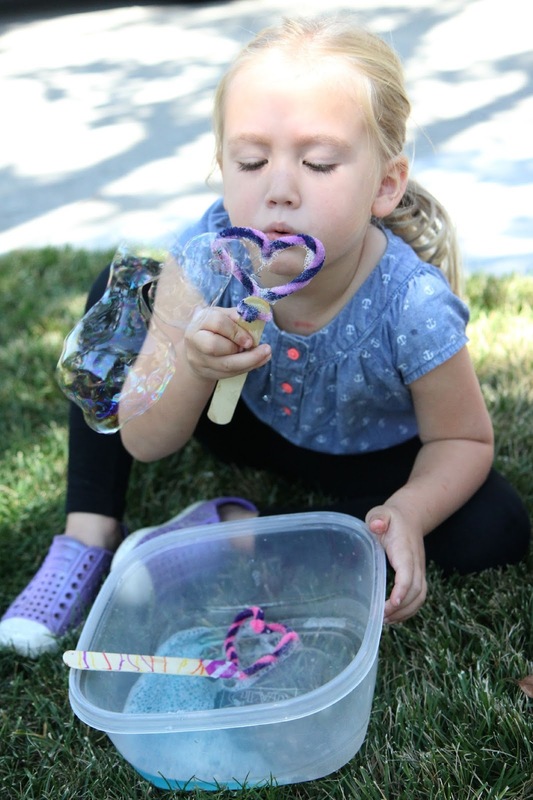 The kids took turns soaking their bubble wands into the bubble recipe and blowing lots of bubbles! Since it was so windy outside sometimes all they had to do was hold out their wands and the wind blew the bubbles for them! 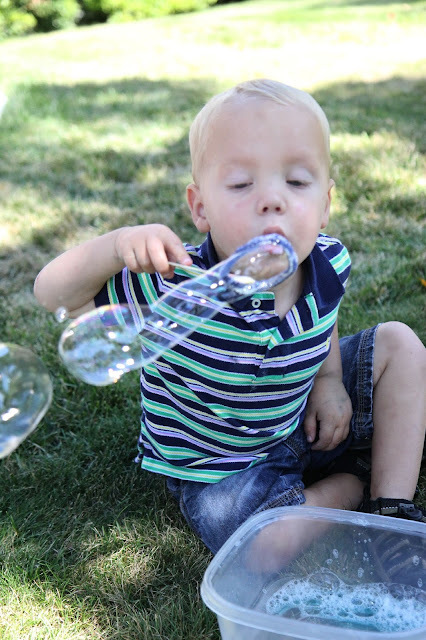 The kids blew bubble after bubble until every ounce of our bubble juice was gone. What a fun way to spend the afternoon! 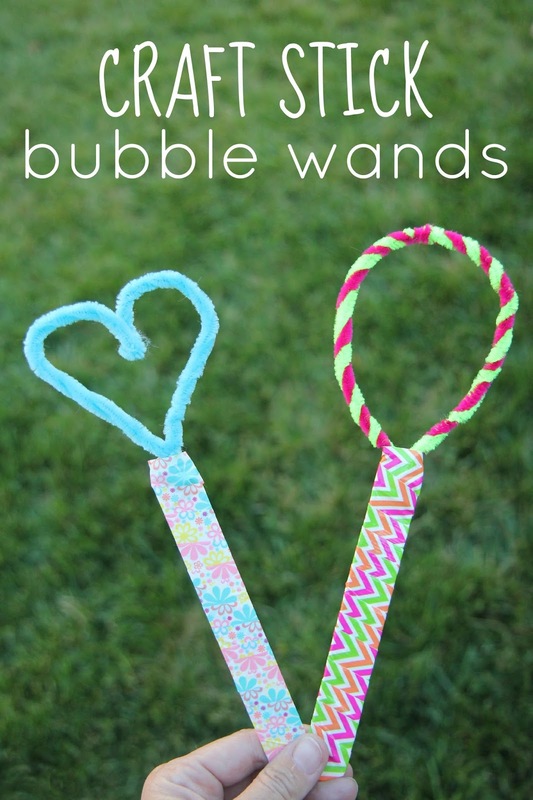 If you haven't tried out making pipe cleaner bubble wands yet I highly recommend doing it! The pipe cleaners start to get heavy after a bit (especially if you make thicker ones like we did), but since the craft sticks are so big they stay in place pretty well. You may even want to triple or quadruple the bubble recipe so that you can play for even longer!! 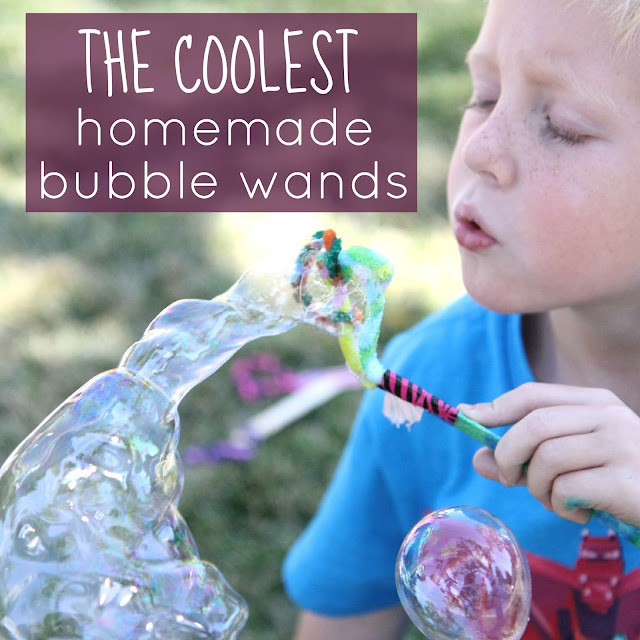 Have you ever made any homemade bubble wands with your kids? Thanks for your note. I am so glad you like our activities. Please create your own activities and share them on your blog. Please do not copy our activities. Thanks so much!